What’s on our hobby minds this year at this time? Two things, at least! 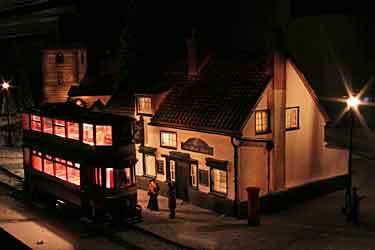 One is: who are the winners of the World’s Smallest Working Model Railroad Challenge? No more suspense, the winners (and other inspiring entries) are right down the page. 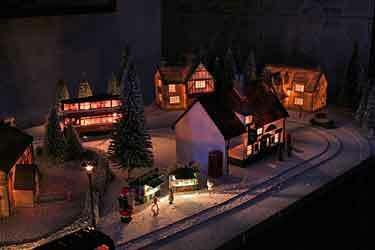 The other thing on many of our minds is: seasonal model railroads. This time of year it’s fun to put together a small display layout for a showcase location in the house. The season for scenery (in the northern hemisphere)? Winter, of course! Here are some examples. Howard Leroy Lamey, from Jacksonville, Florida USA, makes and collects cardboard “glitter houses” (in a style popular from the 1930s to the 1950s) as his main hobby. 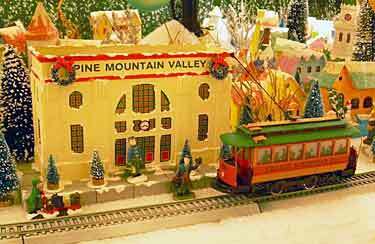 Each year at this season he sets up a display including a railroad—and this year it’s under his Christmas tree and features a Bachmann bump-and-run trolley/tram! Here are some photos of his delightful show… our thanks to Howard for permission to use his photos here and in the page title above. For more about Howard’s efforts, see his website. Markus Hartwig, from Pulheim-Brauweiler (near Köln/Cologne), Germany, built this charming British style H0 tram (trolley) layout as a Christmas decoration for his living room. Baseboard size is just 100x50cm (39.4×19.7in). Markus also revealed a little secret: “Serious modellers may kill me, but after awhile I switched off the motor, and the tram became a static display as I could not stand the noise for hours.” I understand exactly how he feels! The challenge closed at the end of November, and the judges have been scrutinizing the entries to discover the winners. There are two (very small) prizes: one for the smallest volume (length times width times height) of a layout; the other for the smallest ratio of the layout’s length relative to its track gauge (to allow large-scale entries an opportunity to win). The winners in each category are presented here—congratulations to them both! During the process the judges also found some ingenious, creative, and inspiring accomplishments among the entries, and so authorized a category of “Distinguished Runners Up.” These are also presented below. So sit back and enjoy a tour of some of the smallest and cleverest model railroad layouts to be found in the world today! The smallest volume entered turned out to be 11.31 cubic centimeters, or 0.69 cubic inches — about 2/3 of a cubic inch! 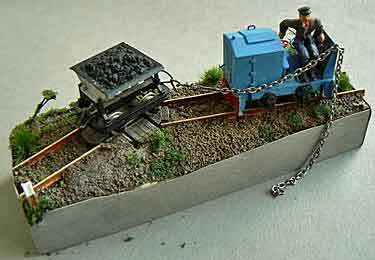 Felix selected N scale because he felt it was the most reliable performer in the small scale sizes. 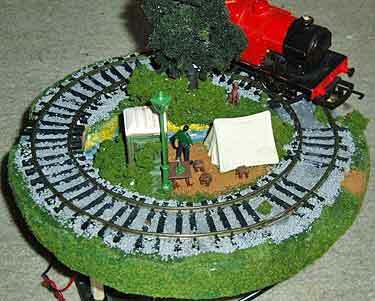 And he figured that a simple circle of track would be the most space-efficient design. 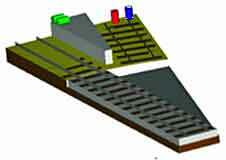 He used a CAD program to set the smallest radius possible for his N locos, which turned out to be 20.5mm, yielding a layout diameter of 6cm. Because he needed to relax the gauge by 0.5mm to accommodate the very small radius, he handlaid the track—his first attempt at that task! By using a very thin base, he held the thickness down to just 4mm. 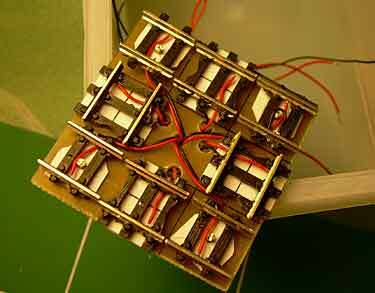 To see his prize-winning result, watch Felix Geering’s video at right. The thickness of the layout as built measures 5.69mm, yielding a total volume of 11.52 cubic centimeters or 0.70 cubic inches — only 0.01 cubic inch larger than Felix’s winning entry! However, because of his super-efficient layout geometry, Christophe’s length-to-gauge ratio was just 45mm:9mm, or 5:1… easily winning the ratio award! Although I think it would be difficult to find a prototype for this particular track arrangement, Christophe’s ingenious entry richly deserves our congratulations! He exhibited the little layout (and the O scale speeder he’s constructing to run on it) at RailExpo 2008 in Paris at the end of November. It’s shown in photos 20-24 on this page. Nearly all the entries in this Challenge showed considerable inventiveness and craftsmanship… so much so that the judges felt they should be presented as Distinguished Runnners Up, to provide inspiration and ideas for other space-starved modelers. After seeing this gallery, no one will ever again feel that he has no space for a model railroad layout! Here, in no particular order, are the Distinguished Runners Up in the World’s Smallest Working Model Railroad Challenge. I think you’ll enjoy them! Wagon begins in position coupled to the loco (above left). Wagon then gets pushed onto the turntable and uncoupled. A chain is attached to the end of the wagon farthest from the loco, looped around the upright rail and attached to the loco (above right). The loco reverses, pulling the wagon away from it (in the opposite direction) and off the turntable onto the opposite spur. Drive the loco up to the turntable. Attach the chain to the closest end of the wagon (below left). Reverse the loco pulling the wagon onto the turntable (below right). Remove the chain and rotate the turntable. Drive the loco back up to the turntable and couple-up. Reverse the loco with the wagon coupled to it. Tim comments, “Quite a bit of faffing around – but great fun! 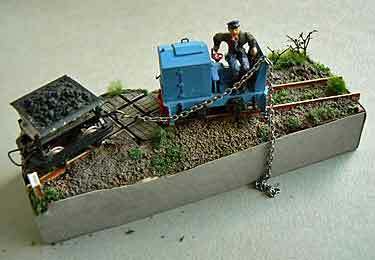 A very delicate hand is required.” He was inspired to make a chain-shunting layout by seeing Colin French’s The Wagon Works layout at an exhibition. You can see it in Scrapbook #54. 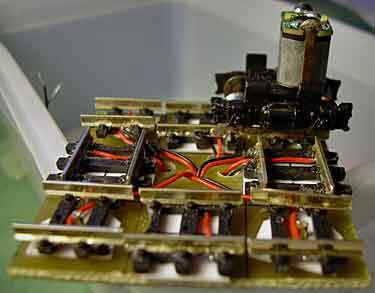 Carsten is a zealous Z-scale fan, and he has contributed a number of excellent Z layouts to this site over the years. His Challenge entry is — what else? 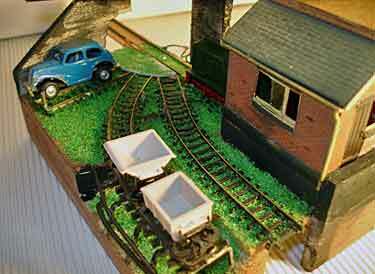 — a very tiny Z-scale layout. It essentially consists of a 65mm (2½in) sector plate and two 35mm (1-3/8in) spur tracks flanking a loading/unloading dock. Rolling stock would be a Köf II switching loco and a small 33mm long car. Note that, in this case, using a sector plate is more space-saving than a transfer table, because it requires only a triangular plot rather than a rectangular one! 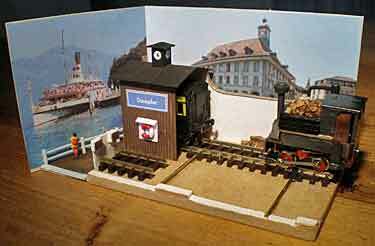 Chris’s entry is an N scale layout that “represents the small annex of a busy European station, its purpose being to convey passengers to the lakeside and lake steamers. Hence it came to be called Dampfer (steamer) to distinguish it from its more illustrious neighbour. 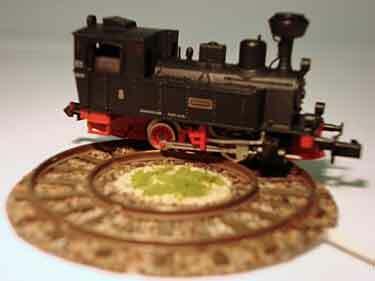 The length of the layout is 3½in (89mm) and width is 2in (51mm).” The steam locomotive is scratchbuilt. Chris comments, “It all works very well indeed, and I find operation very relaxing as I don’t have to make decisions, except when to water the engine!” Note that a small backdrop and tiny bit of esplanade have been added to the layout for photographic purposes, showing how much a little scenery can improve the appearance of our work. John’s entry comes under the heading of “diabolically ingenious, though not at all prototypical!” The entire N-scale layout is a traverser leading into a gauntleted track, thus feeding two interwoven sidings (a great space saver)! Dimensions: 118.2mm (4.6in) long and 26.54mm (1.04in) wide. Total lateral travel of the traverser is 2.5mm! Rolling stock is a Minitrix British Railways side-tank loco and Graham Farish Esso oil tanker, both well over 10 years old. John also offered some tips for further reducing layout size: use a short railmotor (self-propelled passenger/goods unit) rather than a loco and goods wagon; use .020in thick styrene instead of .040in for a baseboard; shave the thickness of the sleepers (crossties); use a smaller code rail. The layout measures 12x1in (305x25mm). 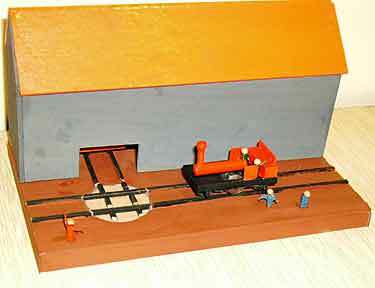 John drew some of his inspiration from the Z-scale Einfuss layout in Scrapbook 71a. The photos below illustrate the process of moving a car from one side to the other. 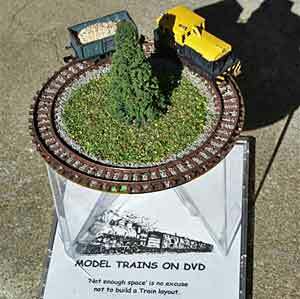 Murray’s pleasant N-scale layout circles a 120mm (4.7in) DVD. 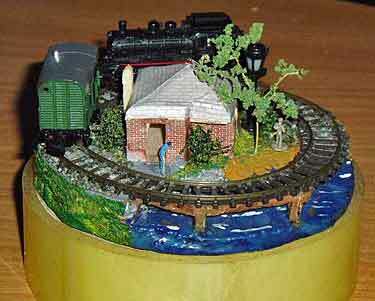 He claims, “This is probably New Zealand’s smallest working Layout. A 4.5 Volt battery keeps it happily running for hours. Thomas set a record for “most entries by a single individual.” He submitted three. One was purposely built for this challenge and is shown in the upper photos (right and left). 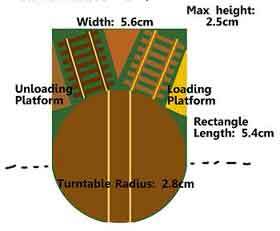 This is an N-scale layout based around a small turntable and two goods (freight) platforms. Thomas named it with an atrocious pun: Two Platforms on One ‘N’-d. 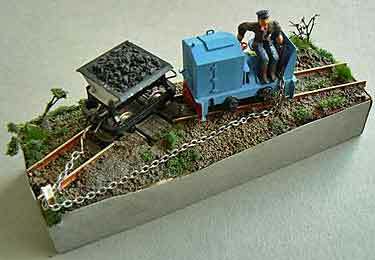 The rolling stock consists of one Micro-Trains truck converted into a flat and a tiny diesel loco found on eBay. Dimensions are listed on the track plan. The other two layouts are ones we’ve seen before, in Scrapbook #60a. 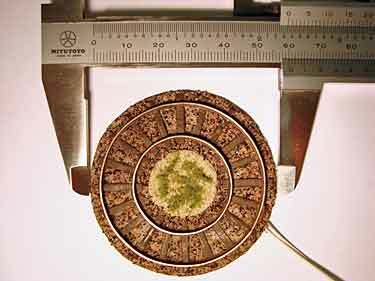 A Z-scale pizza based on a miniDVD (8cm (3.1in) in diameter) (lower left photo) and an HO pizza on a CD, 120mm (4.7in) in diameter. 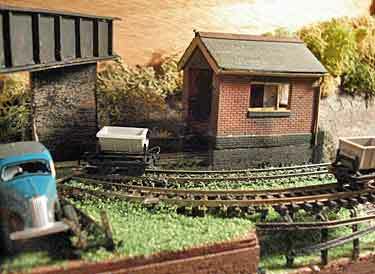 For more on Thomas’s work in this area of very small layouts, see his website. A number of layouts submitted were rejected by the judges as non-conforming to the rules of this competition. However, two of these entries had such merit that the judges recommend they be published as inspirations for other modelers of very small railways. We’re proud to present two new micro layouts with Citations of Excellence. 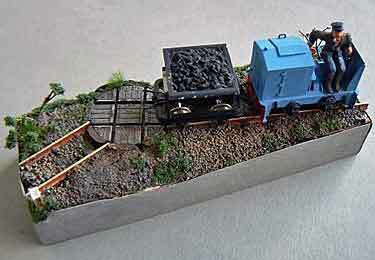 Kevin’s layout named Bayed Guano Grit (an anagram of “Tiny Broad Gauge”) uses N gauge wheels and track to represent a British 7-foot broad gauge prototype. This gives the layout a scale of approximately 1:240. A major cargo hauled by this particular railway was guano from South America, in wide use as commercial fertilizer. 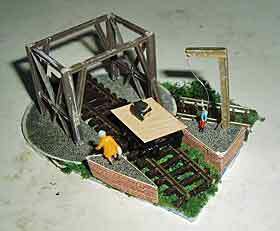 Kevin is a dedicated modeler of very early railways. Layout dimensions are 310x110mm (12.2×4.3in). Rolling stock comprises a single Egger-Bahn railcar. Nigel’s strategy is very similar to Chris Gilbert’s in his Stourbridge Town (a six-foot G scale layout at the opposite end of the size spectrum): he shows both ends but leaves out the long, boring middle part. A special commendation is due Nigel for his splendid scenic treatment of this theme! AND NOW, A FINAL WORD FROM WINTER! from G. Geoffroy, from Neuves-Maisons, France, the clown prince of European modelers. He actually posted this on YouTube! Click on the triangle to begin. 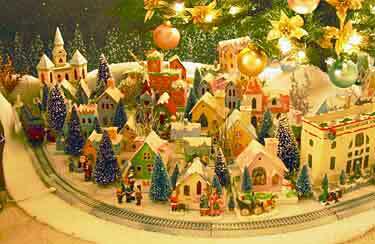 Happy Holidays and a Joyous Railroading New Year to All!